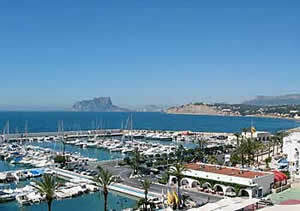 JaveaCasas are expert property advisors for the Javea, Moraira and Denia areas. Having lived in the area for over 12 years and visited for over 19 years, we can provide advice and guidance on purchasing moraira property for sale. Through our network of respected Moraira estate agents we have access to hundreds of Moraira property for sale, with a database that is updated daily. We also have working relationships with many independent estate agents in Javea, and acting as your advisor, we can visit these agents on your behalf, and collect a portfolio of Moraira property for sale for your viewing. Moraira property is popular with property buyers because of its unspoilt setting, with 8km of Mediterranean coastline backed with mountains. Moraira has a small population of only 9,500 and withholds its fishing village heritage, with many small fishing boats to be seen heading out in the early hours of the morning, to sell their goods at traditional fish markets later that day. Because of Moraira’s limited size, Moraira property for sale prices tend to be a little higher then those of Javea’s, and certainly of those elsewhere in Spain. But in return you can enjoy one of the best locations on the Costa Blanca, with an ideal unspoilt setting, and more hours of sunshine then anywhere else in Spain Allowing you to enjoy the Spanish weather, and settle into your new life in the Sun. Investing in Moraira property for sale, and renting in the summer months can generate a good income, with Moraira’s population swelling by over 20,000 people in the holiday season. Private villa and apartment rentals are well sought after, making Moraira property a very good investment for rental purposes, and future price rises for property in the area. If you would like further information on Moraira property for sale, then please do not hesitate to contact us. Alternatively, you can view our Moraira Property for Sale.